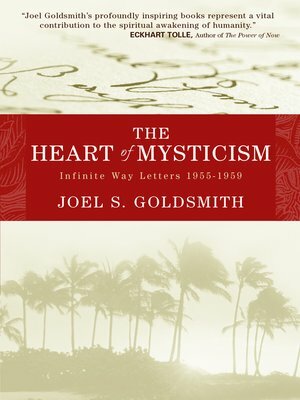 The Heart of Mysticism is a collection of the monthly Letters Joel Goldsmith sent to students from 1955 through 1959. Originally published as individual volumes for each year, this collective edition is the most comprehensive anthology of Joel's work in a single book and covers a vast range of topics. Each letter is a lesson in spiritual living and provides instruction in specific spiritual principles that can be applied in daily experience. Goldsmith considered his monthly letters to be a vital link with his students, in which he could communicate the deepest experiences that came during his ongoing class work. He once said, "There is nothing more precious in our entire library than the Infinite Way Letters." Readers can browse the rich table of contents and find a Letter that resonates with a current life experience, or can work through the Letters month by month to follow five years of the work of one of the great mystical teachers of our time. Since its publication, The Heart of Mysticism has become a treasured favorite for many Infinite Way students.